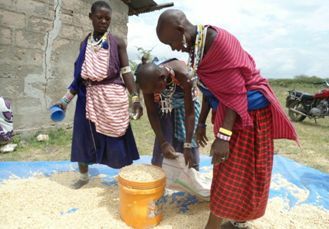 The Evangelical Lutheran Church in Tanzania (ELCT) has donated 264 metric tones of maize in response to food needed to stave off starvation of people in northern Tanzania. The Mission of ELCT is to make people know Jesus Christ and have life in its fullness by bringing to them the Good News through words and deeds, based on the Word of God as it is in the Bible and the Lutheran teachings guided by the ELCT Constitution. 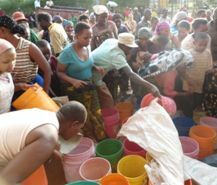 So far the Government admits that at least 50 districts in northern Tanzania are affected by acute shortage of food due to drought, poor seasonal rains and dependence on rain-fed agriculture. The ELCT Deputy Secretary General Planning and Development, Mr. Mallumbo William Mallumbo, said recently that apart from providing food to those affected by drought; the farmes will also be given drought resistant soghurm seeds as there are all indications that the weather might not be favorable as it was the case last year. Food beneficiaries in Meru Diocese. He said the ELCT in collaboration with her partners, has been distributing food to hunger-stricken families in Arusha and Kilimanjaro regions between January and March this year. 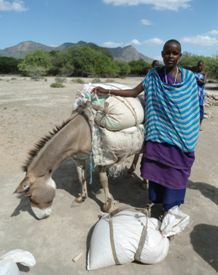 He said maize was distributed to 17,600 people but the supplies are not enough especially in Monduli district. The two northern Tanzania regions are in the same ecological zone with the drought-stricken regions of the Horn of Africa. They dependent on rain-fed agriculture, with more than 80% of its population depending on subsistence agriculture. 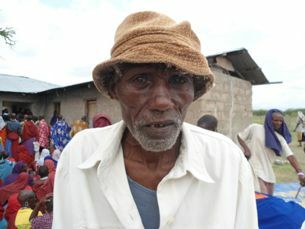 When some of the beneficiary were interviewed, they admitted that there is a change in weather patterns and like most of the countries of Eastern and the Horn of Africa, the effects of the prolonged drought are indeed, the worst drought in memory. People bring their own buckets or other packaging material. Records being kept to show how much food was given to the beneficiaries. Those who cannot write stamp with their thumbs. The Community agrees on which day food is to be distributed. The most vulnerable families are identified by the community. Food is given to all in need without any discrimination. 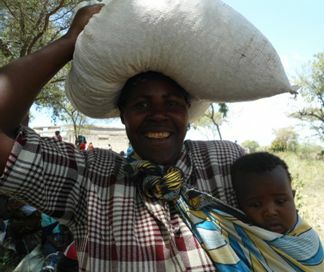 In January this year 72 metric tons of maize were distributed in nine villages - Pangaro, Tarite, Bagamoyo, Muungano, Ngama, Olerbuku, Mferejini and Mkanyeni in Pare and Mwanga Districts through the ELCT Pare Diocese whereby 4,254 people benefitted. 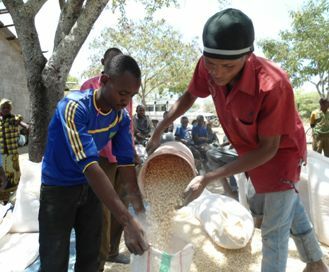 In other parts of Kilimanjaro region covering the ELCT Northern Diocese received 40 tons of maize distributed in February/ March at Himo, the area around Kilimanjaro International Airport and in the area around the Moshi Sugar Plant Company (TPC). In January/ February three wards in Arumeru District  Malula, Maroroni and Patanumbe that are part of Meru Diocese received 60 tons of maize for 3,410 people. 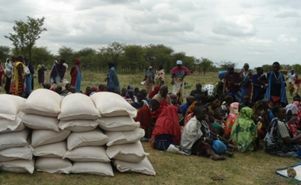 In Arusha region the ELCT North Central Diocese received 71 tons distributed to people in Makuyuni, Mswakini, Dondonaado, Oltukai, Meserani and Mbaashe areas. The areas were selected because they had the most vulnerable households. 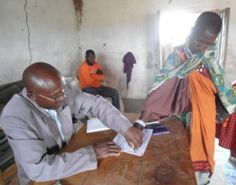 Partners of the ELCT through the ACT Alliance donated some US $ 234,954.34 to enable the church purchase the cereals and meet other costs for the food to reach its destination. Donations were from the Church of Sweden who parted with US $ 71,776.34; (Evangelisch-Lutherische Kirche in Bayern) the Evangelical Lutheran in Bavaria (US $ 77,640); the Finnish Evangelical Mission US $ 77,538 and the United States based Wider Church Ministries (US $ 8,000). 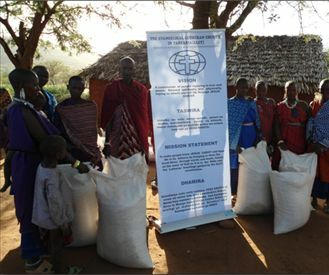 Mr. Mallumbo said 10 tons of soghurm seeds will be distributed to farmers in Pare and Meru Dioceses. He said during the first week of March 5,000 tons of soghurm seeds will be distributed in Same and Mwanga Districts in Kilimanjaro and 5,000 tons will be distributed in Arumeru District in Arusha. Some 2,500 lead farmers in the two regions have been identified. They are expected to donate back at least 5kg of soghurm seeds after harvesting towards a seed bank in order to supply seeds to other farmers.